Poli's shadow was the only thing that moved in the vast surrounding desert. Sun god Taiowa beat down almost overhead, shrinking the shadow-self from a slender trailing silhouette to a squat pool of darkness, the distorted image of a pueblo woman bearing a basket on her head. A second shadow swooped across the desert, then another, swift and fleeting. She lowered the basket of herbs to watch. Buzzards circled above, blots on the sapphire vault of sky, riding updrafts and gliding on the breeze. Something dead must be close by, but who or where was of no concern. Not newly dead. Older dead had surely found their places in the Spirit World. She replaced the basket and trudged on, climbing the mountain slope. The trail wound upward along the steep cliff-side and narrowed to a ledge with a sheer drop from the outer rim. She faced the abyss, sidling around a blind corner, still balancing the basket. The ledge widened one step beyond the corner. Not three paces away lay the dead thing--a deer carcass--its carrion stench permeating the air. But a flash from amber eyes and bared white fangs warned that another had found it already. The circling buzzards would have to wait their turn. The fangs belonged to Iisaw, Brother or maybe Sister Coyote. One side of Coyote's shiny black lip quivered in time with a throaty rumble. Its forepaw claimed ownership, pressed into the hump of dun-colored fur. The deer must be four days dead, buzzing with flies, its head at a crazy angle, the belly gaping and seething with maggots. Perhaps it had been hunted and driven over the granite cliff that loomed above. Iisaw was a mother coyote with low-hanging dugs who'd followed the scent, needing food for herself and the pups. Now, fearing the prize was about to be stolen, she was poised to spring, fur bristling down her spine and hindquarters trembling in readiness. Without moving her head, Poli glanced to the rim of the ledge. It would be death to jump twice the height of a tall pine tree to the rocky wash below. A backward step might tell Iisaw the threat was retreating, needing only a leap and a slashing bite to hasten the withdrawal. A step forward would be worse. In that frozen moment, her quick breathing rasped in rhythm with rapid shocks deep within, fist blows from that being that lived in there, the one the Ancestors once tore from a captured enemy's chest. Back then, it was sacrificed to Taiowa to keep the world in balance. But a sudden idea broke the paralysis and gave her courage. The song! The tribe's chant about the race between Coyote and Swallow was a part of childhood lore, something Mother Coyote would surely understand. She sang in a voice that quavered at first, but soon steadied. For her they race, death to loser. "You see, Mother Coyote, how your grandfather's grandfather won the race. Now let me pass in peace. 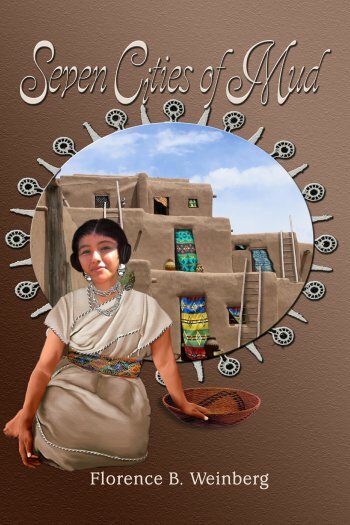 I am only of the Swallow Clan and I live in Puaray Pueblo." The song worked its magic. Growling at first, Iisaw cocked her head and sat back. Fur along the spine was now lying flat, though one forepaw was still on the carcass. It was time to inch forward, keeping as close to the outer edge of the trail as possible. Mother Coyote rumbled another prolonged growl, but remained sitting, following every slow movement, watching each step until the trail wound behind an outcrop of the cliff. The nursing mother would now turn back to the meal, and the supposed thief could go in peace. Pusivi was the goal of this pilgrimage, the sacred cave up the mountain, only four bowshots further. Youths from the pueblo, after extensive purification ceremonies, went there to keep vigil and fast, hoping for a vision to reveal their life's direction. It was time to meditate there about her own future. Should she marry Mákta? The tribe said yes, but misgivings held her back. She'd always followed a special life-path, even as a small child, toddling after Grandmother on herb-hunting excursions. How vivid were those memories! The wind had loosened wisps of the old woman's white hair, and her wizened, leathery face glowed with delight when she found yet another rare plant. The recollection brought a tiny smile. Some of those forays lasted all day, and sometimes she and Grandma would stay out overnight. Was it possible that five winters had passed since Grandmother had gone to the Spirit World? The old woman had taken the place of her own mother, who'd died in childbirth, and a father who'd disappeared no one knew where. Collecting plants was now second nature, thanks to Grandmother, and she was now the one who supplied the tribe with herbs rather than grinding corn or cooking, plastering and repairing the pueblo, the tasks that kept the other women busy. The joy of discovering new plants and their uses was hers as it had once been Grandmother's. The community, a second family, accepted her contribution. Often enough she gave them something exotic to flavor the squash, beans and corn the men cultivated. Men didn't search for plants and herbs for medicines. Instead, they hunted animals to feed the tribe. Their other jobs were cultivating the crops and weaving. The shadowed mouth of the cave offered a cool contrast to the mid-day heat. She first lowered her basket and swirled the shawl from her shoulders, spreading it on the cave's stone floor--the shawl her beloved Hótewa had woven, Hótewa, now gone forever--then squatted at the entrance and took inventory of the plants. Those useful for medicines would be dried and stored and the rest shared with the women, to be used in cooking. The piñon pine nuts would be roasted on the embers and shared later. There were never enough of those to go around. Then, cross-legged, she sat facing outward, hands folded in her lap and eyes closed against the glare, relaxing every muscle and waiting for the tumbling thoughts to cease. But her mental reflecting pool remained troubled; nothing formed there. Mother Coyote and the dead deer were not back there on the trail after all. They were present in her mind, plucking at her along with the story of Coyote-Boy who killed Swallow-Boy. Why could she think of nothing else? Of course! The Swallow-Boy of the song was Hótewa. What is that sound? I hear keening; someone is dead. I see five hunters, chanting funeral songs, carrying a man's broken body into the plaza and laying him out for all to see before taking him into his kiva. I hurry toward the plaza, carrying the plants I've found, but Lénmana, Flute-maiden, my best friend, grabs my shoulders. "No! Don't go over there!" Hótewa? Almighty Taiowa, NO! I'm afraid to look, and yet I must. I tear myself from my friend's arms and run toward that misshapen form. My beloved Hótewa, my husband! His body is gashed and bruised, his face distorted. Blood, so much blood--dried and blackened--trailing from nose and mouth, from gashes on his body, from arms and legs lying all wrong. I can't speak, can't breathe. The others back away and let me grieve. Someone is wailing somewhere far away, a pitiful, lonely sound. I realize it is me. It's ME! As I thrust a fist into my mouth, a hand grasps my shoulder. It is Mákta! "We were chasing a deer. He came too close to the cliff and slipped. We ran to the edge, but he was already down there, all broken up. It took us hours to climb down to him, then to get him off the mountain. I grieve with you, Poli." She'd had time enough to sit and think since the funeral, to accept her loss. Hótewa had first come to her when she was ten and he a year older. He was a graceful, straight-backed boy, harmonious in every way. "When I'm a man," he said, "I'll marry you." She'd agreed, and he'd grown into someone beautiful, not too tall, retaining that grace and those perfect proportions. Mákta was handsome, too, but she'd never trusted him. Not since the day when--they couldn't have been more than eight at the time--she'd come upon him out in the wild lands. She'd climbed a boulder, unnoticed, and saw him pounding something with a rock, muttering over and over "Kill! Kill!" His victim was a harmless horned toad whose blood splattered the rock outcropping. Fearful, she ran all the way home, afraid he'd pound her the same way if he could catch her. Her thoughts returned to her beloved. True to your word, you came to me the very day you were initiated into your kiva, Hótewa, dressed with great care. Your woven shirt was dark blue, you wore a clean loincloth and new deerskin leggings. Your shining black hair was knotted behind your head and tied with yarn dyed red with sumac berries. Yes, and you'd tied blue-green yarn around your wrists and just below your knees. Your clan brothers had painted reddish ocher stripes from the bridge of your nose to your cheeks, so perfect, two each side. You were beautiful. You surprised me by climbing my ladder and catching me squatting there, sorting my plants, and I stood to greet you. That's when I saw Mákta, two levels down, staring up. He was scowling, and turned away as soon as I saw him. You didn't know. You were smiling in your usual slow manner, intent on what you'd come to say. "I've come to marry you, Poli, as I told you so long ago. You are beautiful, as lovely as the butterfly that is your namesake. May I come in?" Your words made me smile in return, for you were the beautiful one, not me. I hadn't thought about marriage much, but you changed all that, Hótewa. I knew then that Taiowa, the Creator, had foreordained it. My part was laid out before me by our customs and my own preference, as plain as the main trail along the river. I welcomed you into my home and you sat watching me make something delicious to eat, just for you. It was my special pudding, with ground roasted piñon nuts and chaparral berries mixed with finely ground white cornmeal and a bit of water. Oh, yes, and honey from the small pot, and a little salt to brighten the flavors. You watched me the whole time, watched me make a fire, watched me mix batter for the thinnest, finest blue corn tortillas and then toast them on smooth, hot rocks until they were crisp. I served it all to you in my best bowl, happy when you nodded your approval. Then I led you to my bedchamber where I spread my best blanket. We mated that night, planned for our children and pledged our love forever. That had been seven days before the hunting trip. How sweet the memories of that special day and the few that followed. The pueblo began the formal marriage ceremony the next day and two days thereafter, with the chief medicine man of her clan presiding. Their house was to be the one her grandmother left her, furnished with wedding gifts. They sat on a bench where the whole pueblo could bear witness. Her aunt, who was her nearest relative, stood at her side in place of her mother. Hótewa's father stood by him, while the elder of her clan spoke. He blessed them in the name of Taiowa and the Corn Mother, then listed their duties: to love and protect each other, to provide for one another, to care for each other in sickness, to take joy in their youth and health and to produce many children. After each promise, they embraced to seal the vow before Taiowa and the Corn Mother. Then the heads of the other clans brought them fine blankets as wedding gifts. Hótewa wrapped her in one of the gift blankets and she chose the most beautiful one to wrap around him. The elder told them what they could expect from life together and recited their duties to the pueblo. Then the ritual gifts were brought forward. Hers were the metate and mano, grindstone and grinder used for corn, then an olla, a big one to hold much water. A comal--a flat clay dish like a platter--and several drinking vessels joined the others. She promised to cook and provide for her beloved husband and their future family. For Hótewa, they brought weapons for hunting and protecting his home--bow, spear, war club and shield. Then came the tools he would need at all times. First a pouch, or cacoxte, for carrying heavy loads on his back, with its mecapal, a leather band to bind around his forehead. He was given a new hoe for cultivating the garden, where abundant produce would provide for Poli and for their children. Then the dances began, continuing far into each night until the ritual was completed. That was four days before the hunting trip. Just four days. Time slipped past her in a gray blur after the accident. The world and its concerns meant nothing without Hótewa. Three moons had waxed and waned when Mákta came to her, just as Hótewa had done. Mákta's shirt was not midnight blue, but the color of dark smoke. "I've come to mate with you, Poli. You have no one left but me." "You come too soon. My mind and my heart are still filled with Hótewa." She'd turned her face away. "Go, Mákta. Now is not the time. I cannot receive you." She'd had the last word, but he'd been haunting her anyway. Unless she went far from Puaray as she'd done today, he was always somewhere in sight. At least he'd left her to her grief for three more moons without approaching her again. she'd just had a thought, brief, like a distant lightning flash. What was it? Her forehead creased, then cleared. Ah! At last! Why hadn't she seen the obvious parallel? It took a mountain Kachina from the Spirit World to lead her toward understanding. The deity must be here, in this mountain cave, helping her. My chosen one, my most beloved husband, Hótewa, as straight and beautiful as the finished arrow for which he was named, died just like the deer. He fell over a cliff on this same mountain. And Mákta, whose name means Claw, came to me at night three moons ago, to mate with me. The claw is cruel and sharp, not straight and beautiful. Perhaps Mákta, like Coyote, is a trickster. He was out hunting with Hótewa that day. Did Hótewa trip and fall, or? Fray Agustín Rodríguez arrived in the capital city, México, from San Bartolomé, the northernmost mining camp in New Spain, by traveling two hundred sixty leagues as the crow flies, and maybe a hundred more because of the tortuous roads. He'd covered most of it on foot, since his mule went lame after less than a third of those rocky, rutted, wearisome leagues. In Santa Bárbara, the prosperous town near his starting point, he'd bartered his mission's eggs for sausages that had lasted him almost the whole trip. He stopped briefly at a friary just outside México City to accept food and a pair of sandals before pushing on, driven by his desire to petition the viceroy for permission to make an entrada, to mount an expedition. Trivia such as personal appearance and cleanliness were farthest from his mind. Like his brother Franciscans, he cared little for such vanities. He'd taken his vow of poverty quite literally in all its implications. Agustín paused at the palace gate just long enough to bow in humility before the guard, who barely glanced before motioning him inside. He persuaded his way past the concierge, who questioned him with down-turned mouth after hearing of the friar's purpose. Then he confronted a succession of secretaries, some more difficult than the concierge, but when they were shown the petition drawn up in proper form and signed, they were impressed enough to let him pass. At last he was ushered into the presence of Viceroy Lorenzo Suárez de Mendoza, Conde de Coruña. The king's representative looked up from the petition his secretary had just placed on the desk, a deep crease forming between his finely arched brows. He stared at the unkempt friar for all of ten seconds, then plucked a perfumed handkerchief from his sleeve and held it to his nose. Agustín was in a nervous sweat, anxious that this imposing personage should grasp the urgency of his mission. It was impossible to sit passively in the brocaded chair opposite the viceroy. Instead, he'd popped up and was pacing back and forth, waving his arms. "Your Excellency, please! Don't refuse me! It's God's will, you see. All of us are children of Adam, and the Bible teaches that all flesh shall be redeemed. That means all the Indians, too. They're not animals, Your Excellency, to be worked to death in the mines; they are men like you and me. Fray Bartolomé de las Casas was correct when he wrote those very same ideas to the king." Suárez de Mendoza's hand slowly dropped, abandoning the bunched handkerchief on the polished surface. He spread his arms, gripping the edges of the ornate, carved desk as he shook his head. Was it refusal or skepticism? Either way, it called for even more passion. Agustín swallowed his growing anxiety. "I've heard estimates of as many as sixty thousand souls living along that river up there they call the Río del Norte, or sometimes the Río Grande. If what I've heard is true, Your Excellency, we need priests, a thousand, two thousand--more--to convert them. How can any good Christian like yourself sit idly by and let so many souls go to Hell? God has called me, a lowly Franciscan Brother, to explore those regions and get an accurate idea of the numbers and nature of those people, so we can save them and bring them the Good News. Your Excellency, you must grant me that license to lead an expedition to Cíbola!" The viceroy raised one eyebrow. "Cíbola? Do you speak of The Seven Cities of Cíbola? How am I to know you aren't just looking for gold, like Francisco Vásquez de Coronado? His Seven Cities of Gold turned out to be pure illusion, nothing but cities of mud, and he wasted thousands of ducats from the royal treasury, not to mention the lives lost pursuing his fantasy." Coronado? Oh, there were stories of the Coronado expedition, maybe two generations back, yes, but he'd seen nothing in print. Cabeza de Vaca and Francisco de Ibarra were explorers' names that came most readily to mind. Ibarra, governor of the northernmost province, was based in Santa Bárbara. Everyone in those parts knew of his doings. Cabeza de Vaca had published his account, but most news of the north filtered into San Bartolomé in the form of rumors, brought into the mission by half-mad prospectors or their half-breed guides who stopped for a free meal and place to rest. Agustín stopped pacing and swung to face the Conde de Coruña, focusing with burning intensity on the nobleman before him. "Gold is not my concern, Your Excellency. Our treasure is not here on earth, but in heaven. The Bible teaches that, too, as you are well aware. I must be about my heavenly Father's business, and for me as a missionary that means the saving of souls. I beg Your Excellency; I must have your official permission to go north into that new land, to verify those estimates of the number of souls, to prepare the way for bringing them the Good News." Suárez rose, running a finger around the neck of the fluted white ruff that topped his black silken doublet. The finery drew both admiration and scorn. Save for glimpses of crimson in the slashes of the man's puffed trunk-breeches above his black silk stockings, there was no color to him at all. Silver buckled shoes clattered on the tiled floor as he strode to the window and pulled aside the maroon velvet drape, pinning it against the marble frame. He leaned on his hand, left fist on his hip, and stared out, saying nothing. That window looked out on fine, new buildings being erected in the zócalo, the square below. A vast cathedral that supplanted those pagan Aztec temples was rising toward the heavens in a stony paean of praise to the Almighty. It represented the very spirit of the proposed mission to those far northern regions, the mission to destroy idolatry and save souls. "I'm not asking for much, Your Excellency, just the license and enough funding to hire a few soldiers and buy enough livestock to sustain us on the trip. I would never try to imitate Francisco de Ibarra or Cabeza de Vaca. You're aware, of course, that we Franciscans are not allowed to handle money ourselves. The paying and the buying would have to be done through middlemen." Suárez turned from the window to face him. "It sounds as though you've got it all planned out already. Don't you think you're being somewhat presumptuous, Fray? "Agustín Rodríguez, Your Excellency. I beg you to consider my petition. Yes, we have planned it well, and of course it is drawn up with great care. This mission is the will of God, of that I'm certain. Surely, you wouldn't want to thwart the Almighty, Your Excellency!" "Very well, peace! Peace, Fray Agustín. I'll read your petition. Come back tomorrow for my answer." "Ah, but the convento is quite a distance away, Your Excellency. Could you not read my document and make your decision while I wait?" Suárez burst out in apparent exasperation. "¡Dios Mío! My good man, I can see now how you got through all the barriers my secretaries must have thrown in your path, so that you ended up in here with me. Very well, wait by the fountain in the patio below. My private secretary will fetch you when I've had a look at the petition." "Thank you. As you wish, Your Excellency." Agustín leaned against the fountain, refreshed by the cool spray and the floral perfumes. The cascades of water and of the fuchsia-colored bougainvillea blossoms hanging from the courtyard walls seemed like a foretaste of Paradise. The viceroy would find the petition more than 'in order.' It was filled with precise calculations of the distance to be traveled and the number of soldiers needed to protect a small party, along with the number and types of animals to be purchased, all estimates based on earlier attempts by others to explore that unknown territory. His entrada would be leaner, more efficient than theirs. The signatures at the end of the petition were his own and that of another friar, Father Fray Juan de Santa María. Juan was indisputably the brains of the endeavor. He in turn called Fray Agustín its driving force. Both men had planned together, discussing and visualizing the dangers and hardships they'd face. Juan had been a wonderful asset, transferred north three years ago from the capital to the mission at San Bartolomé. He knew about the king's orders not to give gold seekers or slave hunters any further licenses, but plenty of clandestine operations were being launched without official sanction anyway. Who could prevent it? On the other hand, Juan reported there was royal money set aside for missionaries--he had no idea how much. The funding of a small expedition like the one they were proposing would scarcely make a dent in the hacienda real, the royal treasury. An hour later, much to his astonishment, Agustín stood in the zócalo, a fresh breeze wrapping his habit around his legs and ruffling the papers in his hand. One was a license complete with seals, its ribbons fluttering in the wind. It authorized him, Fray Agustín Rodríguez, to recruit as many friars as needed and up to twenty soldiers for the safety of their persons. He could add personal servants, the number and types of animals he deemed necessary to feed the whole group during their journey, and enough herders to tend them. The license was granted and signed with a flourish by His Excellency Lorenzo Suárez de Mendoza, "in order that the said Franciscan friars be enabled to visit the settlements of savages in the northern regions, estimate the population, and prepare to preach the Holy Gospel to them." A second document granted him the right to bestow a captain's commission upon one of the soldiers, so that order might be maintained among the seculars. He read the documents twice. Three times. The third document concerned the libranzas seguras, the authorization to draw upon the royal treasury for the animals and other food supplies for his expedition. HIS expedition! He would be another Saint Paul! He knelt on the cobblestones and raised his clasped hands to God, all three documents clutched between them, reciting an Ave María, a Pater noster, and a Gloria Patri. Tears of thanksgiving ran down the deep furrows in his hollow cheeks and dripped from his chin. It seemed to Agustín in his euphoria that the return journey to Santa Bárbara passed in half the time his trip south had taken. The settlement, swollen from a sleepy village to a roaring boom town fed by the mines of San Bartolomé, startled him with its bustle. He leaped aside as a charro on a wild-eyed horse cantered past, barely missing him. Until recently, they'd have respected his Franciscan habit, but no longer. Surely, the town had not been this rowdy when he left. He shook his skirts, spattered with muck flung from the flying hooves, and looked around him. The street, still unpaved with cobblestones, was rutted and muddy from last night's rain, but crowds were out despite the mud. They loitered in groups in front of the stone and adobe buildings, men mainly--prospectors, cattlemen whose herds were milling and mooing in corrals outside town, adventurers, farmers, soldiers, even priests. He'd come the half-league from Misión San Bartolomé, quiet and peaceful with its view of the tree-lined Río Florido. Peace seemed confined to those mission walls, however, since gold in all its forms was evident everywhere else, right down to the gold buttons on that priest's cassock over there. The whole place reeked of gold, just as the mines stank of the misery of the enslaved Indian miners and the greed and violence of the owners. He'd already recruited his fellow missionary, Fray Juan de Santa María, with his fine mathematical mind, and he must find another priest here in Santa Bárbara and enough soldiers to guard them. He had an idea whom to contact when it came to the priest. His own Indians spoke of a fraile, a padre who was thoughtful, wise and kind, even with them. His penances fit the sin and were rarely excessive, so they said. Spaniards who attended his Masses said the same things, that Father Francisco López was a generous and compassionate man. San Sebastián, the church where Father Francisco was assistant pastor, was the most impressive building in town, but getting there presented a problem. Unless he re-crossed the muddy street, he'd have to thread his way through a rowdy group clustered around two men arguing over the price of a roan horse tethered nearby. Disturbed by the commotion, the horse rolled its eyes and jigged, stamping and whisking flies off its back and jerking at its rope. Once in the thick of the crowd, Agustín shrank from an elbow in his ribs as one man began cursing the other. The sudden jab made his heart leap and quickened his breathing, but should he interfere? Only if an actual fight began. Just in time, a bystander grabbed the arm of the most aggressive man, and the fight was avoided for the moment. It was now possible to break free of the knot of onlookers. He hurried away with a sigh of relief, trotting through mud that sucked at his sandals. The quarrel back there was flaring up again. The interior of the church--silent, cool and empty--provided blessed peace, an island where he could barely hear the raucous crowds outside. The air hung heavy with incense from the last Mass. Candles burned unwavering below the image of Our Lady of Guadalupe and at the feet of a beautiful statue of Saint Sebastian, with his hands bound behind him, his near-naked body pierced by arrows and his ecstatic face raised to Heaven. A movement in the back corner drew his eye and he glimpsed a Franciscan robe disappearing into the sacristy. He hurried down the aisle, pausing for a hasty genuflection before the altar, and burst into the sacristy in time to see a silhouette framed in the rear door just before it clicked shut. He ran, reached for the door handle and called. "Father! I'm looking for Father Francisco López!" The door reopened abruptly, almost knocking him down. "Yes? What? I'm Fray Francisco. And who're you? Hmmm. I think I've seen you." "Agustín. Fray Agustín Rodríguez. I'm a missionary out at San Bartolomé. Just a simple friar, though, not a priest. Do you have a moment? I need to talk with you. Please!" The man he'd caught up with was tall and slender, with kindly gray eyes, a half-smile lighting a long-nosed, ascetic face and a shock of wavy brown hair tonsured like his own. Not bad looking. Good voice, too. yet. Let's sit outside. I think it's dry enough. So, what's this all about?" He led the way as he spoke, to a garden behind the church. Ancient live oaks provided dappled shade for a struggling boxwood hedge inside a black iron fence. In the center of the garden, an arbor abloom with yellow roses arched over a bench. The priest felt the seat, brushed it off with a hasty hand, settled himself and patted the space beside him. He turned to his fellow friar, eyebrows raised. "Well?" but that's not our concern. I've been called to begin a mission among them and find out how many priests we'll need to bring them the Good News. I already have the king's license to mount an entrada. I still have to recruit the military guard, but wanted to enlist another priest first, in addition to my fellow missionary, Fray Juan de Santa María. Do you know him? He agreed to come. We've heard many wonderful things about you, and we're praying you will join us." He spoke at length, outlining the plans and speculating on the length of the trip, its hardships and rewards. At the same time, he offered Francisco the position of Superior. As such, he'd make final decisions on their approaches to savages they intended to convert. Francisco sat for a while hunched over with his elbows on his bony knees and his forehead propped on the heels of his hands. He was obviously excited, tempted no doubt by the proposal he'd just heard, yet holding back, weighing pros and cons. He raised his head at last.
" He bounced to his feet and took long strides around the garden, hands clasped behind his back with head bent, mumbling to himself. On the third sweep, he stopped. "All right, I'll go with you." Chamuscado surveyed the room, still buttoning the flap of his trousers. He'd just entered the most notorious cantina in town, El Toro Ardiente, from the retrete out back. The regulars were all here: gamblers, drunks, prospectors down on their luck, eager young adventurers hoping to strike it rich and trying to team up with a pro, a scattering of soldiers, and whores, of course. He turned his head with a jerk. What the hell was that Franciscan friar doing there? Wasn't this cantina, of all places, off limits to those busybodies? Was nothing sacred? That one had been prowling around town for the past week. He was from that mission at San Bartolomé. Chamuscado's regular job was patrolling the mines. More than once he'd taken an Indian miner to the mission for last rites after the miserable creature had been beaten or clubbed to the point of death. Or maybe the Indian had been the victim of a knife fight between miners, sometimes between owners. He'd never bothered to get to know those missionaries; it was their job to say the right words over the dying, his job to bring them in. him! The yawn ended in a snap, followed by a bellow that carried above the cantina's din. "Sergeant! I need to speak with you!" For a moment, Chamuscado thought the cleric mad--there was no other sergeant in the room--before he realized the words were directed at him. His reaction was just short of hostile. "What about?" What would you want to talk to me about, for Chrissake? The friar was looking around, as if not wanting to announce his business to others. "It's an important matter, believe me." The friar got to his feet. "I see by your raised eyebrow that you're curious. If so, follow me." The little fellow was quick, observant, and able to read faces. He'd already started for the door, glancing behind him. What mischief might he have up his woolen sleeve? The mystery was irresistible. It wouldn't hurt to find out what it was all about. The little man struck off toward that church, San Sebastián's. Chamuscado shortened his own stride to stay abreast. "Well? What's so important?" "An expedition to the north. A legal one." "Ah! A legal expedition! How far north?" "We'll talk more in the church. I'm Fray Agustín Rodríguez, leader and organizer of the expedition. You, Sergeant? I know you from the mines, but I've never heard your name." "Chamuscado. Actually, Sergeant Francisco Sánchez. They call me Chamuscado--the Singed--because of my red beard. So, what about this entrada?" A legal expedition was rare. Most were illegal, clandestine slave-hunting excursions that brought back miserable naked creatures, cowed and beaten, barely clinging to a semblance of humanity, to be worked to death in the gold mines. The king had prohibited such brutality, but how was the monarch to know what was needed in the mines? How could he supervise what went on across an ocean and thousands of leagues farther away? A legal expedition? How could such a thing be? And what did this little churchman have to do with it? It was worth following up. They sat one behind the other in two pews, Fray Rodríguez in the front one, twisted around with arms propped on the back. A bank of candles at the feet of the Virgin provided enough light so he could see the friar's face. The man had become animated, no longer secretive. "I've spent months gathering information from people who've been up the great river to the north, Sergeant Chamuscado. They tell of whole cities of Indians, hundreds of leagues from here, with thousands of inhabitants. As a missionary, it's my responsibility to organize an entrada to bring the news of Our Savior to them, to convert them to the True Faith." at least as far as anyone knows down in the capital. I've been on some slave-hunting expeditions, too. Those we don't talk about. So, what sort of permit did you get? How did you get such a thing?" The little man bristled. "I went to México and petitioned the viceroy, Lorenzo Suárez de Mendoza." "And he let you in? He saw you? I don't believe it." "Not only saw me, he heard me out. He was impressed by our petition, our plan. We'd drawn it up in detail." "And Father Juan de Santa María, my fellow missionary out at San Bartolomé. He's attended to some of your dying miners, so you've seen him. The viceroy read the petition and granted permission. I was authorized to recruit more priests and as many soldiers as I need. We must have a responsible officer to command the soldiers. That's why I'm talking to you. I've seen how you handle things out at the mines, firm but not brutal. You say you're experienced in campaigning up here, but I need to see your papers. I need references. If I'm satisfied with what I see, I can make you a captain. I have the authorization, the commission. Then you could recruit a native interpreter, enough soldiers to protect us, trustworthy ones, and Indian or mestizo servants. We're only three Franciscan friars, you see. You wouldn't need many." "Hmmm. You said there were cities. Who told you about those? I've heard rumors, too. The ones I heard said somebody named Coronado led a big expedition up there about forty years ago and found nothing worth risking your life for." "Sergeant, it depends what you think is worth your life. My reports say there are wealthy cities up there. People who farm and know how to weave, and who wear real clothes, not like these stark naked savages around here. It might be a second México. Whatever we find, we have a duty to bring them the Christian message." imagine the possibilities. All of them might be wallowing in gold up to their armpits. He licked his lips as his eyes narrowed. The friar knew something he wasn't sharing. Nobody would risk his neck just to convert Indians, although that did make a legitimate story. No, these priests had ways of learning about things like gold and riches. They were the clever ones, unlike that fool, Coronado. Nothing of value indeed! Yes, he'd go find those cities with the Franciscans, the cities of Cíbola, the Seven Cities of Gold. Seven Cities of Mud Copyright © 2008. Florence Byham Weinberg. All rights reserved by the author. Please do not copy without permission. Before settling in San Antonio, Texas, she traveled extensively as an army brat during World War II. With her husband the brilliant scholar and teacher, Kurt Weinberg, she worked and traveled in Canada, Germany, France, and Spain. After earning her PhD, she taught for twenty-two years at St. John Fisher College in Rochester, NY, and for ten at Trinity University in San Antonio. She published four scholarly books, many articles and book reviews, doing research in the U.S. and abroad. When, after retiring in 1999, she was freed from academe to devote herself to writing fiction, she produced eight novels, ranging from fantasy to historical romance and mystery. Three are in print as well as one in press: a historical romance about the French Renaissance, published in France in French translation, and two historical mysteries, starring the eighteenth-century Jesuit missionary Fr. Ignaz (Ygnacio) Pfefferkorn, two set in the Sonora Desert and one in an ancient monastery in Spain.